Our A++ rating means lower fuel bills and an unrivaled source of heat whatever the weather. Home heating, hot water and cooling at your fingertips. Without the need for buffer tanks or electrical heaters. Renewable and clean energy from the air that surrounds us day and night. With zero Carbon emissions. WiFi enabled so fully connected to the internet giving you full control of your home climate from anywhere anytime. State of the art patented technology that minimises system losses and maximises efficiency. With water flow temperatures up to 65°C and external air temperatures down to -20°C the RED UHE heat pumps can produce domestic hot water and space heating without the need for backup electric heaters. 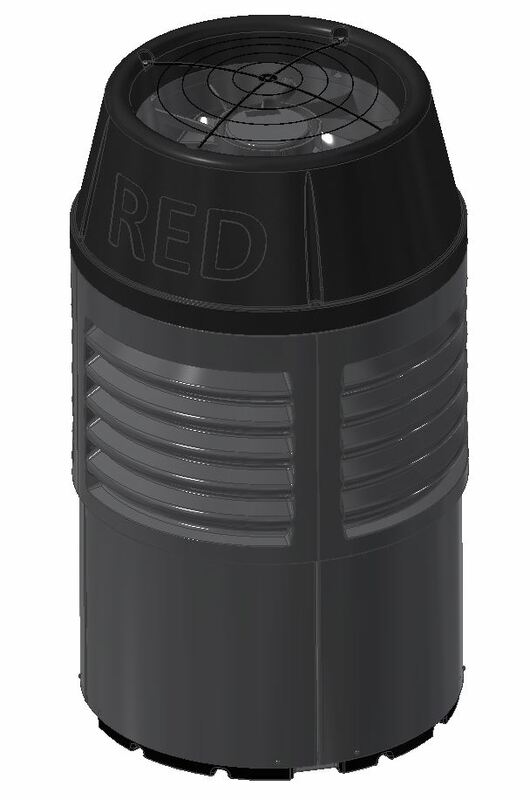 This is possible with with RED’s innovative technology which injects refrigeration vapor to cool the compressor at high water flow temperatures and a secondary heat exchange which maintains capacity at low outdoor temperatures. 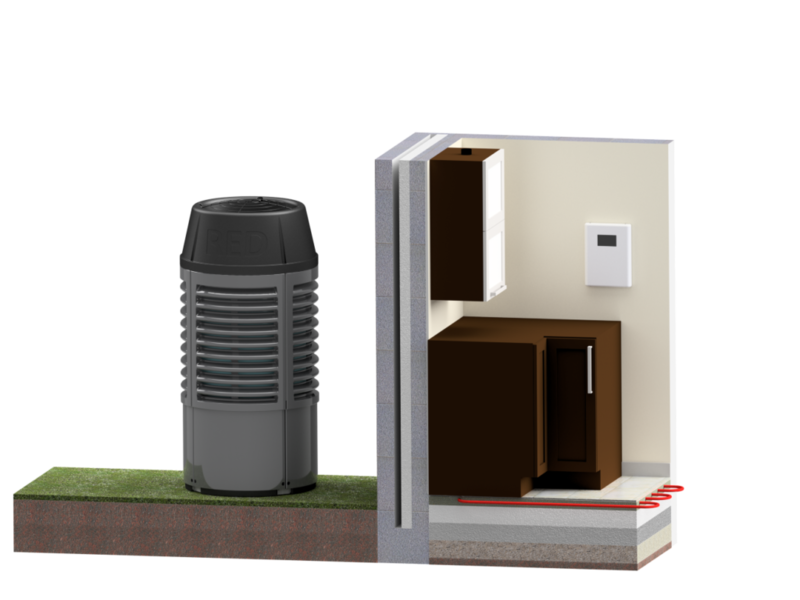 The heat pump is also designed to operate without the need of a buffer tank. This is due to our unique distribution manifolds with combined in low loss header / bypass and the intelligent variable speed compressor which can react quickly to maintain the optimal output for your house both in heating and cooling mode. 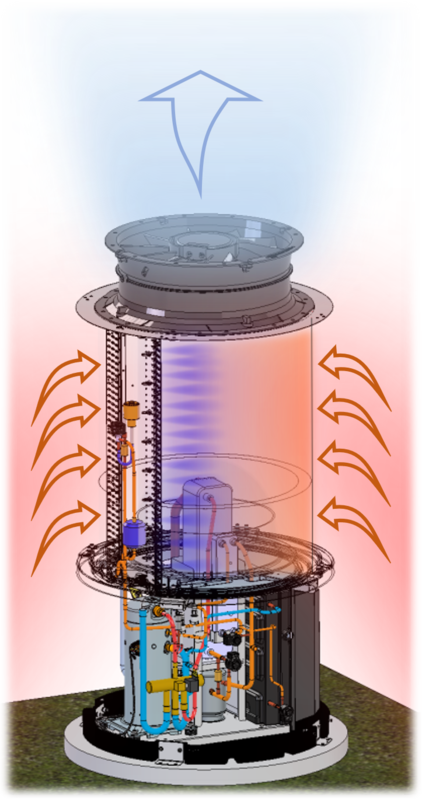 Heat Pumps capture heat energy from the environment using the conventional refrigeration cycle to which means they are able to produce much more energy than they consume. The refrigerant, which cycles around the closed system driven by the compressor, transfers energy from the air captured by the evaporator to the from the evaporator to the condenser where the heat is exchanged into the heating system or hot water tank. 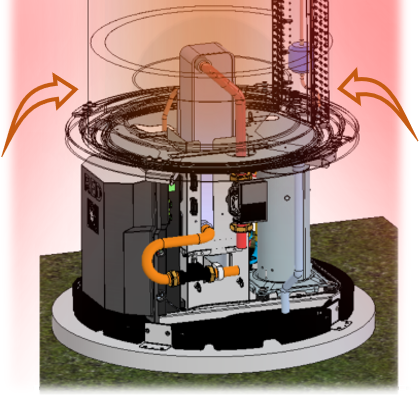 The RED heat pump has the technology to reverse this cycle and also provide cooling to the dwelling. where the heating water enters and leaves the refrigerant condenser heat exchanger. responsible for transferring the heat from the air heat exchanger to the water manifold. Enter to find out more!